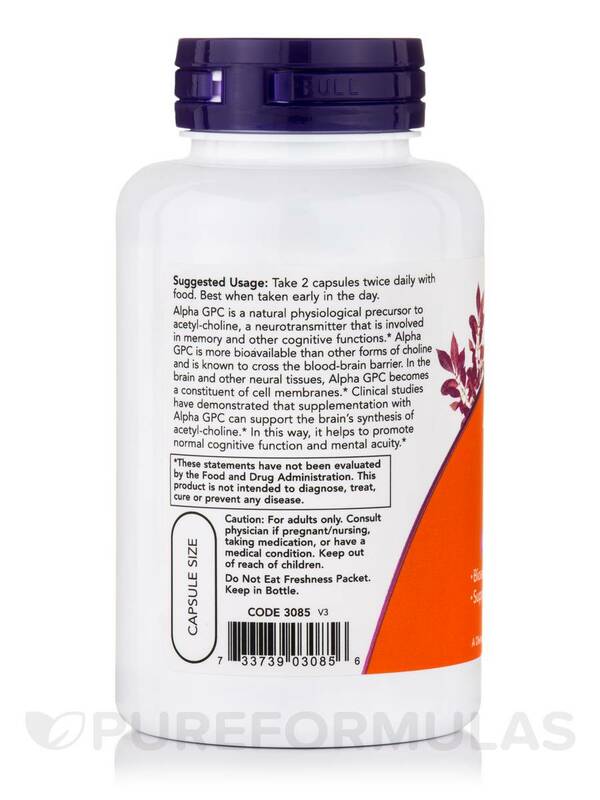 Alpha GPC Vegetarian Capsules from NOW® Foods is an egg-free supplement that could improve cognitive function. This vegetarian product could boost your memory and mental sharpness. 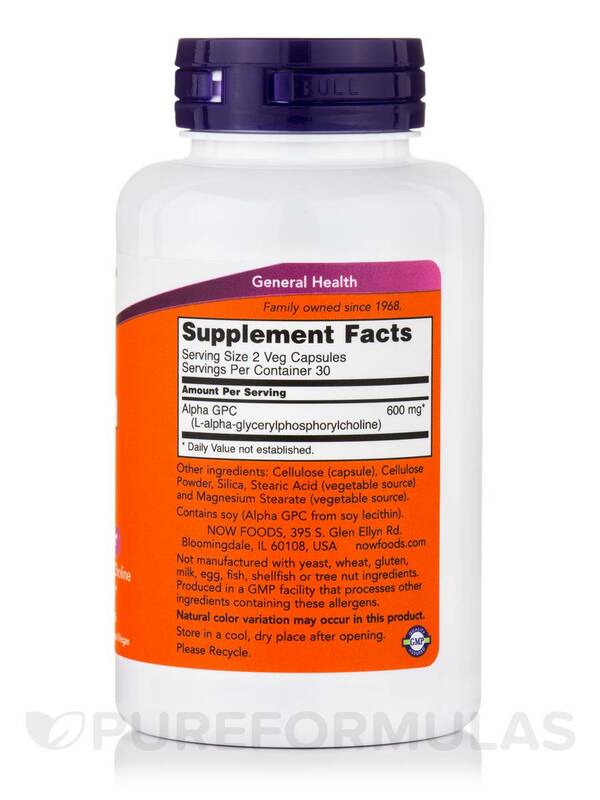 Alpha glycerylphosphoryl choline (Alpha GPC) in this supplement from NOW® Foods is a phospholipid and a source of choline. It aids in the synthesis of the neurotransmitter acetylcholine that allows cells to exchange signals with each other. Alpha GPC may be better absorbed by the body than other forms of choline‚ which helps form phosphatidylcholine that is a vital part of cell membranes. Alpha GPC could stabilize membranes‚ boost cognition and support brain function in elderly individuals. Alpha GPC may play a role in the recovery of brain cells after injury‚ by enhancing memory and learning powers. It could protect nerve cells from toxins. Alpha GPC is water soluble‚ and could improve neurotransmission by augmenting the formation of acetylcholine. This potentially promotes healthy neurological activity. Alpha GPC could improve mood and thinking abilities. 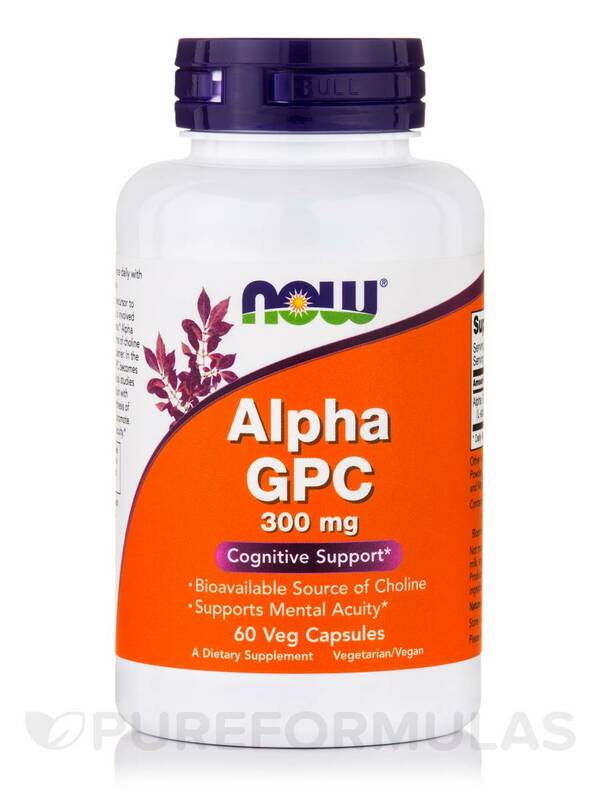 Improve your memory powers and mental abilities with Alpha GPC Vegetarian Capsules from NOW® Foods. Not manufactured with yeast‚ wheat‚ gluten‚ milk‚ egg‚ fish‚ shellfish or tree nut ingredients. Produced in a GMP facility that processes other ingredients containing these allergens. Allergen Caution: Not manufactured with yeast‚ wheat‚ gluten‚ milk‚ egg‚ fish‚ shellfish or tree nut ingredients. Produced in a GMP facility that processes other ingredients containing these allergens. I ordered because I read this version helps cognitive function (there is another version that is more for energy). 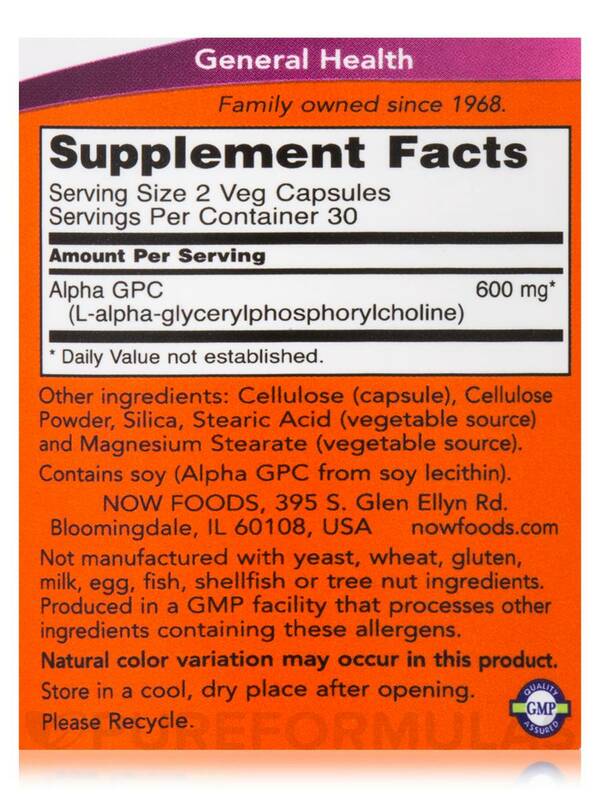 This Alpha GPC 300 mg - 60 Veg Capsules really did for me. I would take one in the afternoon, when I get this confusing/overwelming feeling. I have stopped taking routinely due to the cost, but keep some on hand if needed. 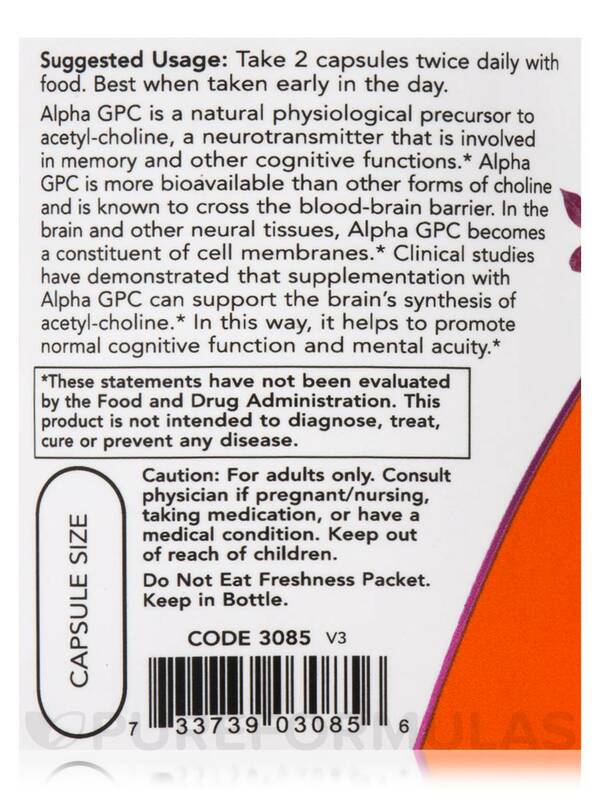 After taking these Alpha GPC my mind as really become more focus on the daily tasks that I have at work, and home. The product has done exactly what I thought it would do after finding and reading research before purchasing this product. I like that it has effected my day to day tasks rather quickly, in a very good way. Need a bigger bottle and more pills for about the same price. Go thru them pretty quick if your taking 4 pills daily. Was taking this product for about 2 months and I havent seen any significant cognitive improvements yet. Not sure if its a matter of not taking them long enough amount Im taking isnt enough or the quality is not as good as it needs to be to see cognitive improvements. Easy capsules to take without any taste. Unsure if there are any improvements associated with taking these.